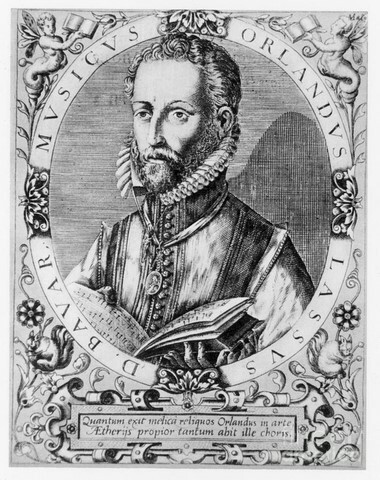 Orlande de Lassus was born circa 1532 in Mons, the capital city of the province of Hainault, and as a child sang in the choir of St. Nicholas Church. While still a youth he was taken to Italy where he served as chorister in Several important court chapels. In 1553, though he was a mere twenty-one, Lassus became choirmaster to the church of St. John Lateran in Rome, but he left that position in the folloving year, 1554, and went to Antwerp. Samuel Quickelberg, a native of Antwerp and Lassus' first biograpber, describes the composer's stay in the Flemish metropolis as an association "with a circle of very cultured, very learned, and very noble individuals, whose musical inclinations he continually encouraged, and who honored and loved him." One of his patrons was probably Antoine Perrenot de Granvelle, a prominent figure in tbe Brussels court, to whom Lassus dedicated his first book of motets, published in Antwerp in 1556. That same year Lassus left Antwerp for Munich to sing in the choir at the court of Albert V, Duke of Bavaria. He became choirmaster in 1563 when his predecessor Ludwig Daser died, and remained at this post until his own death on 14 June 1594. Lassus set only one of Marot's psalms, the popular Du fond de me pensée (Psalm 130). His setting was first published in 1564 by Susato in Le premier livre de chansons à quatre parties... par M. Orlando di Lasso, and was republished several times in the Low Countries and elsewhere. This is the first polyphonic psalm in a Netherlandish chans0n collection to use the Huguenot melody. Psalm collections using these melodies were already available. See e.g. the complete edition by Jean Louys.